Posted on January 26, 2019 by Margaret & filed under Growth/Inspiration, Inspiration. There’s a powerful deck of cards and companion book my writer pals and I have been using for years at our annual writing retreat at the beach. The set is called Medicine Cards by Jamie Sams and David Carson, illustrations by Angela Werneke. Each of us pulls a card and reads it aloud to see what the animal spirit has to say about our life in that moment. For some, it’s a fun parlor game. For me and others, it’s so much more. Since the beginning, people have discerned messages from nature and by observing the habits of animals. Over time, these symbols have become standardized and can help us access parts of our mind that are not completely conscious and available to us. 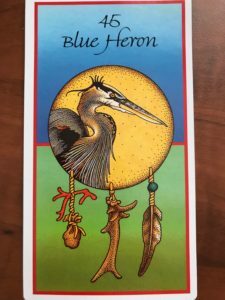 Such it was this afternoon when I pulled the Blue Heron card, for the first time ever. 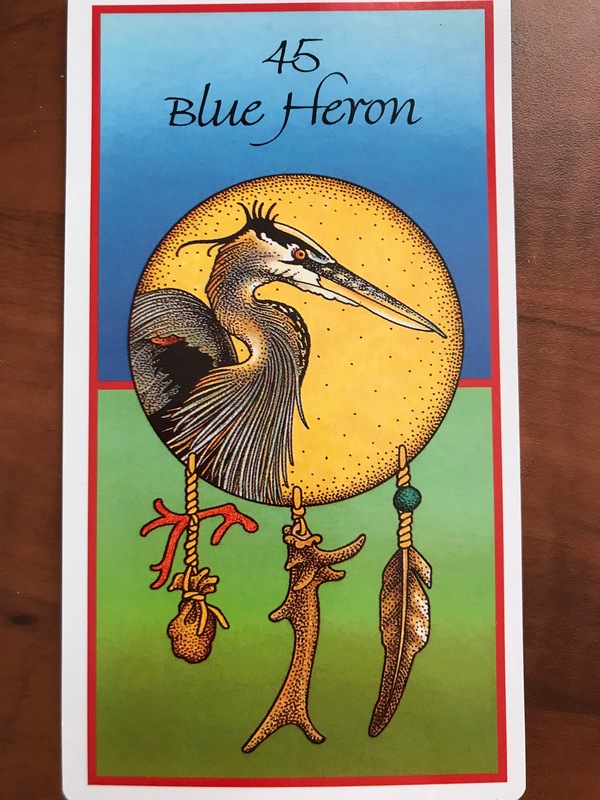 The Blue Heron stands for self-reflection and I am nothing if not self-reflective. My successes in life have always come after I’ve entered into reflection and introspection to understand who I am at my core and what I truly feel called to do. But pulling this card today pointed to something being out of whack with this process. I realized my self-reflective skills of late have been stuck in a groove, like the needle of a record player trapped in a scratch on an old record. Over and over again, I’ve been looking at myself, but not the me of today…the me that once was. And I’m just not that person anymore. This explains why I’ve felt so out of sorts with decisions about the second half of my life—my plans have all been based in self-reflection of a former self. What once brought me joy, success, and money no longer moves me. Moreover, I’ve been pointing my finger at all the things that aren’t right around me. But those things are much the same as they’ve always been. I’m just different. So, it’s time to get out of the blame game, give that needle a little tap so it jumps out of its rut, and start reflecting anew, on the person I am today. If you’ve been feeling like you’re in a rut in your life, I’d love to hear your thoughts. There’s something so powerful about sharing our insights. Peace. That is amazing. And I hear Heron whispering to me, too. I’m not the me I was. Frank and I are not the same WE. I’m not the same writer. Transition is always hard, often painful. But always worthwhile to get through. Thanks for this tap out of my rut. Thank you, Terri. Perhaps at VAB this year, we need to have a discussion about transitions. It seems we’re all going through some major ones.